This baked salmon is good for some Friday night comfort after a long week. Preheat the oven to 180oC/gas mark 4. Grease a baking dish with the softened butter. To make the pesto, place everything in a food processor and blend to purée. To make the garlic potatoes, put the cream, milk, garlic and nutmeg in a large pan and bring to the boil. Reduce the heat and add the sliced raw potatoes. Simmer for 8 to 10 minutes. Place the potatoes and sauce in the greased baking dish. Cover with foil and bake in the oven for 45 minutes, until the potatoes are just tender. Remove the foil and bake for a further 20 minutes, until the top is golden. To bake the salmon, place it on a baking tray, brush with a little oil and season with salt and pepper. Bake in the oven with the potatoes for 12 to 15 minutes, until cooked through. 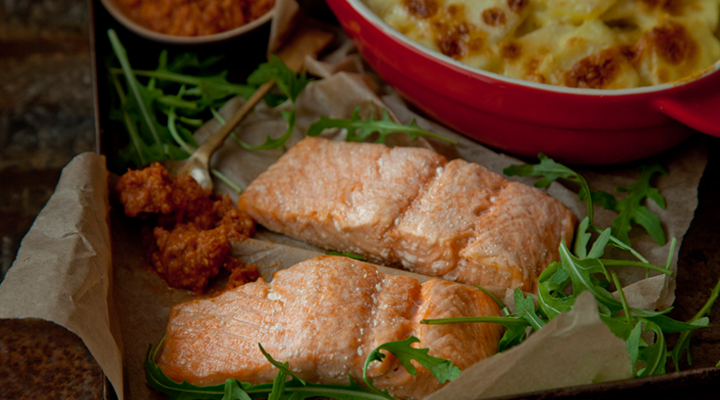 To serve, place a portion of the garlic potatoes in the centre of the plate and top with the baked salmon. Drizzle over some sun-dried tomato pesto and garnish with rocket. You could easily turn this baked salmon into barbecued salmon. Just make sure the barbecue grill itself is good and hot so the fish seals and doesn't stick to it. Season the salmon well and rub both sides with olive oil. Place on the hot barbecue and cook for 3 to 4 minutes on each side. Alternatively, you could wrap the fillets in a tin foil parcel with a little butter, seasoning and some fresh herbs, then pop it on the barbecue for 6 to 8 minutes.